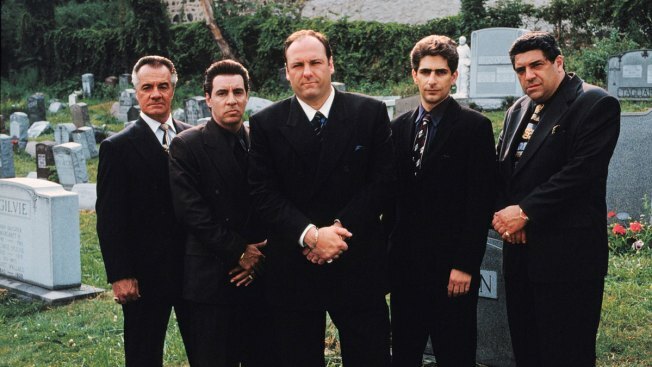 This undated image released by HBO shows the cast of the hit series, "The Sopranos," from left, Tony Sirico, Steve Van Zandt, James Gandolfini, Michael Imperioli and Vincent Pastore. The TV show is celebrating the 20th anniversary of its premiere. The six-season show would win 21 Emmys and become the first cable series ever to win the Emmy for outstanding drama series. The script for the TV show didn't initially seem so special to him. "I was not blown away by the pilot," he admitted. On the other hand, he had long admired Allen and was being offered a spot in his movie "Celebrity." Imperioli couldn't do both and was leaning toward doing the film. "That would have been the dumbest mistake of my life," he says now with a laugh. The reason was simple: The TV show was "The Sopranos," which this year is celebrating the 20th anniversary of its premiere on HBO. The six-season show would win 21 Emmys and become the first cable series ever to win the Emmy for outstanding drama series. It also earned Imperioli an acting Emmy in 2004. More than awards, the show about mid-level gangsters in New Jersey proved that audiences could handle morally complex anti-heroes, paving the way for shows like "Breaking Bad" and "Mad Men," and marking the beginning of the time when TV started eating cinema's lunch. Creator, showrunner and head writer David Chase says all he wanted to do was create a show that he and his friends would like to watch. He had toiled in frustration within the strict confines of network TV for years, on such shows as "The Rockford Files" and "Northern Exposure." "I must admit that a lot of what I went into 'The Sopranos' with was anger. I was angry about all my years in network TV. And I'm one of the lucky ones. I worked for some really talented people and with some really talented people," Chase says. He recalled that a high-level executive at NBC had advocated for something called LOP, which stood for "least offensive programming." Chase chafes at the notion: "It makes for a very bland mixture." "The Sopranos" was anything but bland. It followed the depressed mafia boss Tony Soprano balancing his ruthless illegal business with raising a family. There was brutal violence, infidelity, pasta and loyalty and dishonor. James Gandolfini played Tony with equal parts ferocity and tenderness. "To interact with him was to make a deal with the devil. You would be ethically compromised. And I sort of wanted to show how easily that happens, what that really means. At the same time, I didn't want to do a morality story," Chase says. "I guess the largest thing that I was trying to bring out was it's a pretty cold universe. It's a very cold universe. But we have this thing called love which we can use against that. That's about the only weapon we have. That's where I found myself thinking a lot." Chase wanted to make scenes longer if they needed to be — or shorter — and let his stories unfold slower than a network show. He initially just wanted to make a self-contained mini-movie each week and had to be convinced to continue the story lines (He worried he'd make something like "Dallas.") HBO, he said, never tried to meddle. With his hit show, Chase also proved that audiences were smarter than what they'd been given credit for by network honchos. Fans would tune in to see complicated people in often messy situations. "That was very important to me: Not talking down to people. You cut off so much when you do it the other way. There's so much richness in life and to exclude parts of it is crazy if you're creating something." Imperioli, who was a believer as soon as he actually saw the show's pilot, credited Chase for bringing a cinematic quality to TV. A stunning cast — including Edie Falco, Annabella Sciorra and Lorraine Bracco — didn't hurt. "Everything that people loved about gangster movies and 'The Godfather' and 'Goodfellas' and all that stuff, all of a sudden was in your living room on a weekly basis, in a novelistic, serialized fashion," Imperioli said. "That was really groundbreaking." Before it signed off for good 12 years ago, "The Sopranos" left behind something that continues to be debated — a cut-to-black finale that left everything ambiguous. Even the cast was divided. Imperioli and Gandolfini joined more than a half-dozen cast members in a viewing party in Miami. "Everybody was pretty shocked. No one really expected it to be that abrupt, I think, and that ambiguous," Imperioli says. "The room was kind of torn on whether they liked that or not." Fans of the show won't have to mourn much longer since Chase has a prequel film planned for 2020 called "The Many Saints of Newark." Chase and "Sopranos" veteran Lawrence Konner have written the script and it will be set in the 1960s during the Newark, New Jersey, riots which Chase witnessed. In crafting the film, Chase reacquainted himself with the songs and cultural touchstones of the period, as well as watching a few old episodes of "The Sopranos" to ensure the timeline fits. Should fans expect a few inside jokes? "I sure hope so," Chase answered. He admits to some nerves about the film's reaction: "I think there's always pressure in following something, right? And 'The Sopranos' was such a hit, such a big explosion. How do you do that twice?"